Resuming a multi-year mission to map Antarctic ice in mid October, NASA researchers discovered a miles-long crack in a major glacier that marks the beginning of a new mammoth iceberg. Operation IceBridge scientists flying in a specially instrumented DC-8 jet returned soon after to make the first-ever detailed airborne measurements of giant iceberg calving in progress. The crack in Pine Island Glacier, which extends at least 18 miles (29 km) and is 165 feet (50 meters) deep—enough to swallow up the Statue of Liberty— could break free a chunk of ice more than 340 square miles (880 square km) in size from the vulnerable West Antarctic Ice Sheet. 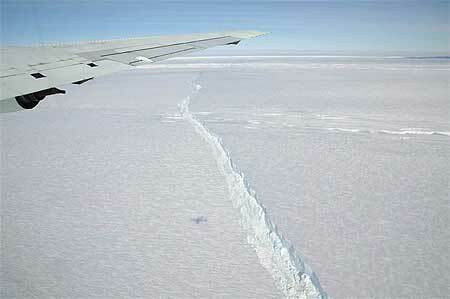 Pine Island Glacier’s ice shelf mostly floats, extending its unstable arm as many as 30 miles (48 km) away from the Antarctic landmass that grounds it some 500 meters (1,640 feet) below the surface. As the glacial ice inland flows slowly toward the sea and feeds the shelf, the arm eventually breaks, calving huge icebergs. 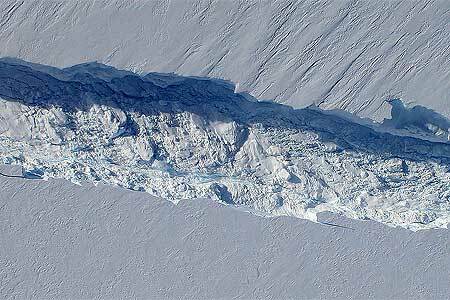 Pine Island Glacier last calved a significant iceberg in 2001, and some scientists have speculated recently that it was primed to calve again. But until an Oct. 14 IceBridge flight of NASA’s DC-8, no one had seen any evidence of the ice shelf beginning to break apart. Since then, a closer look back at satellite imagery seems to reveal the first signs of the crack beginning to cut across the ice shelf in early October. “It’s part of a natural process, but it’s pretty exciting to be here and actually observe it while it happens,” says Operation IceBridge project scientist Michael Studinger of NASA’s Goddard Space Flight Center. The IceBridge team thinks that once the iceberg breaks free, it will leave behind the shortest extending arm of the Pine Island Glacier since recordkeeping began in the 1940s. Pine Island Glacier is of particular interest to scientists because it is big and unstable, which makes it one of the largest sources of uncertainty in global sea level-rise projections. A collapse of the entire West Antarctic Ice Sheet (WAIS) is one of the nightmare scenarios climate forecasters envision in a warming world. If the WAIS were to melt, it could raise sea levels worldwide 20 feet. NASA’s Operation IceBridge, the largest airborne survey of Earth’s polar ice ever flown, is in the midst of its third field campaign from Punta Arenas, Chile. The six-year mission will yield an unprecedented three-dimensional view of Antarctic ice sheets, ice shelves, and sea ice.